Are you considering switching your office telephone system to VoIP phones, but don’t know where to begin? We can help you and explain all here. VoIP phones have several advantages over traditional phone systems, and many SMEs are looking to switch and save money. However, replacing an entire office telephone system all in one step can be challenging, especially when there’s so much jargon floating around and many options available to choose from. There are two major types of VoIP phones: hardphones (regular, physical handsets) and softphones (virtual software). When it comes to hardphones, you get a a dialpad, along with additional buttons used for holding, video conferencing, call transferring and other functions like adjusting call volume for example. Softphones, on the other hand are not physical devices. They are software phones, usually installed on your mobile phone or desktop/laptop. This means that you can make a call or send a voicemail from your mobile phone, but using the softphone application, it will come from your VoIP phone. You can always be reached via that particular phone number if you have a softphone app installed. You can make free calls from your mobile, saving you money personally as well. You can also be reached on your laptop if you have the softphone app installed- doing away with Skype, Facetime and the rest, you only need one number to be reached here. Say you’re a company just starting out and you don’t have an office yet. Your employees can work from home and make calls from their smartphones, whether it’s a mobile or home computer. This can work as a temporary solution until the office is ready, and it’s headache-free. Or if you’re already based in a small office and have one phone line that’s shared by a handful of extensions. They have an Ethernet LAN in the office, providing a broadband service to the computers at each desk. How could they switch to VoIP phones? They should look into a cloud VoIP phone system in this case. This will likely save them money on calls. 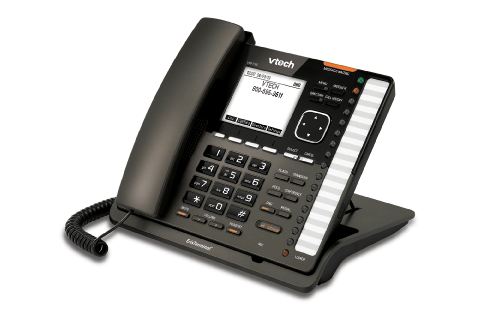 By purchasing a select number of VoIP hardphones and then connecting those to the LAN. With both this and a softphone option, (which usually come as part of many VoIP packages) this should give them a deal of flexibility and ease of use. The majority of cloud phones are handled off-site and as such are easy to install. These are the basics of VoIP phones, introducing the various types of phones available to you and demonstrating the flexibility of each, allowing you to experience the benefits of the ease of use of unified communications.